Interested? 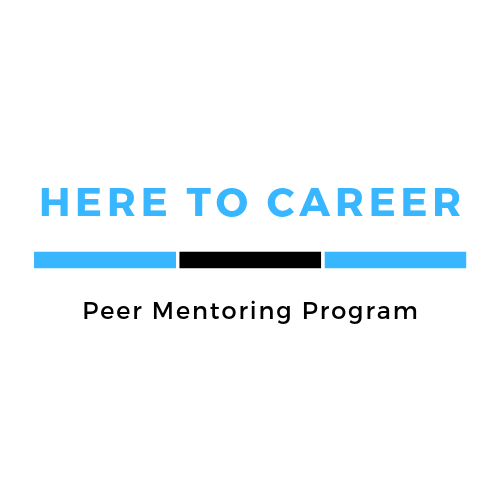 Click the link below to sign up for the Peer Mentoring Program! Hello! My name is Reyna Rodarte and I am the Transfer Outreach Coordinator for the Here to Career: Peer Mentoring Program at CSUSB. I graduated from UC Riverside and received a B.A in Sociology. I am currently a graduate student pursuing a Masters in Higher Education with an emphasis in Student Affairs. I have worked in the education field for more than five years. Helping students achieve academic success is my passion. I have experience with teaching, mentoring, tutoring and advising. My goal as the Transfer Outreach Coordinator is to provide students with valuable resources that will facilitate their transferring process to CSUSB. I want to ensure that students have guidance and a great support system in order to be successful scholars. Our peer mentoring program’s purpose is to increases transfer rates at CSUSB and improve student success in digital media disciplines such as graphic art, media studies, industrial music, and computer science. Overall, I enjoy becoming a part of students educational paths as they advance in higher education. Education is power! For any questions regarding the peer mentor program please contact our transfer outreach coordinator by phone or by email. 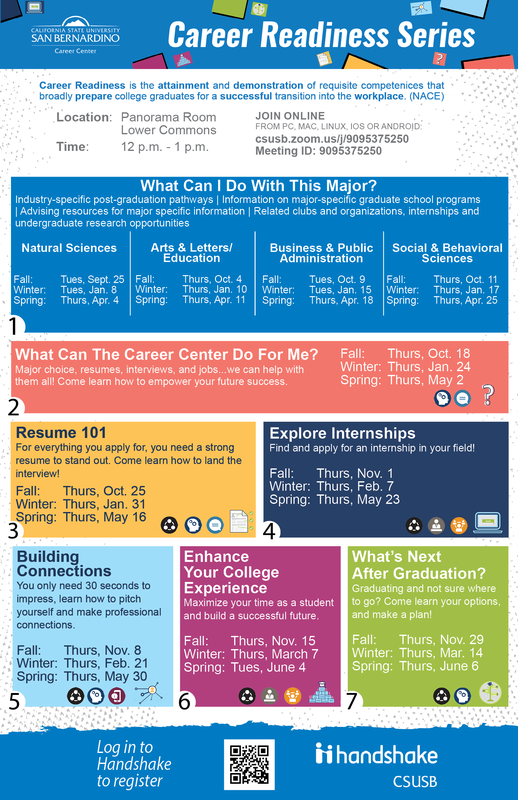 Click on the Career Readiness Flyer to view all workshops available. Times and location vary. 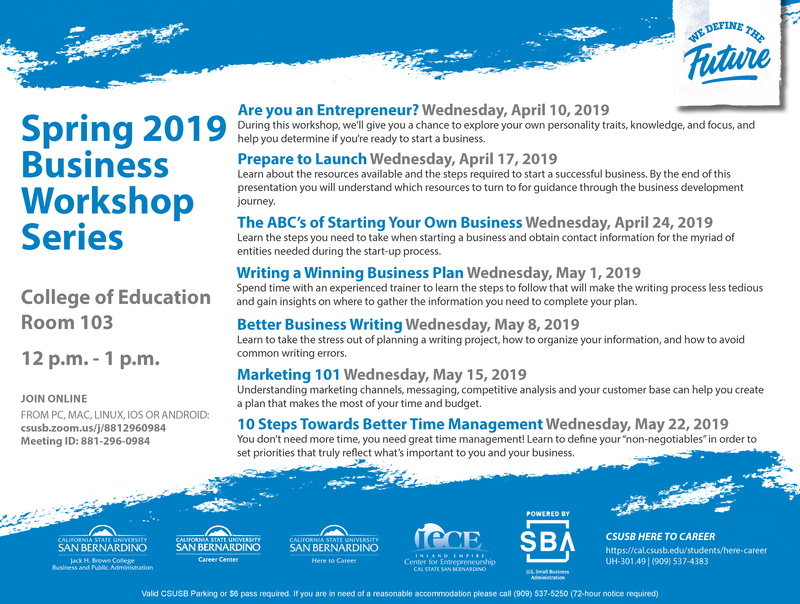 Click the link above for more information on workshops. Click here to schedule your campus tour! February 15: Submit all official partial transcripts from all institutions at which you are currently enrolled or all official final transcripts from all institutions you are no longer attending. March 2: Submit your FAFSA! For more detailed information visit our Admissions and Student Recruitment page here. CSUSB is switching to semesters in Fall 2020! Click here for more information.